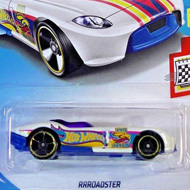 Blitzspeeder is a 2018 Treasure Hunt and 2/10 in the Super Chromes series. The car has a gold chrome body. It has black 5-spoke wheels with gold chrome trim and a black metal Malaysia base. On the sides is the Hot Wheels logo and behind the dark tinted canopy is the low production symbol. 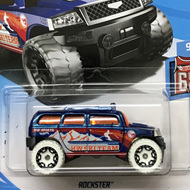 This vehicle can be found in mix “G” of 2018 Hot Wheels mainline cases. The Blitzspeeder made its debut in the 2016 X-Raycers series. It is an original design that features a 700 horsepower V8 engine.